All photos by Catherine Sohn. What do you do when your mother announces to the family that she'll be spending 30 days traversing northern Spain on foot? If you're art and fashion publicist Catherine Sohn, you take her to the outdoors store to introduce her to a revolutionary material called fleece, then pack your knapsack and join her for the first leg of the journey. So, what brought you to Northern Spain? To share a memorable experience with my mother. For many years, she has wanted to hike the Camino to the Cathedral of Santiago de Compostela in Galicia. Pilgrims have traveled this 800-kilometer route for over 1,000 years, and it can take 30 days to complete, depending on your pace. People have different reasons for making the pilgrimage (religious, spiritual, adventure, exercise), but it is a life-changing experience for almost all. How long did you stay? 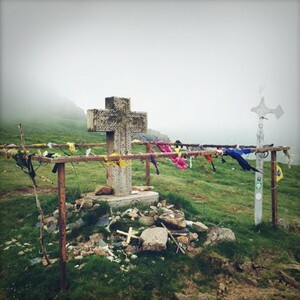 Eight days: two in Barcelona, five hiking the Camino Francés, and one in Madrid. How did you get there? Barcelona to St. Jean de Pied de Port is a long, ten-hour train ride with transfers at Hendaye and Bayonne. Many people recommend traveling via Biarritz. What was the best tip you got before you left? My mother told me to read by German comedian Hape Kerkeling. I read it on the plane. It's a funny, breezy read that gives you a good idea what it's like on the trails. What did you do? 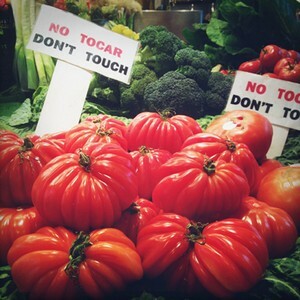 We ate at Barcelona's local food market () and visited , , , Gaudi’s cathedral, and . To begin the Camino, we took the train to St. Jean Pied de Port, a small medieval town in the foothills of the Pyrénées in France. 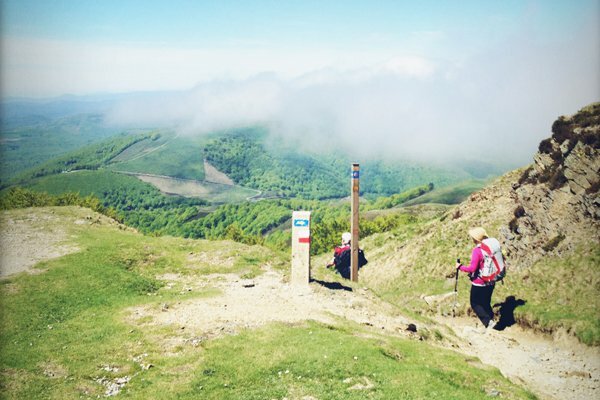 It is the traditional starting point of the Camino Francés trail, the most traveled of all the routes. 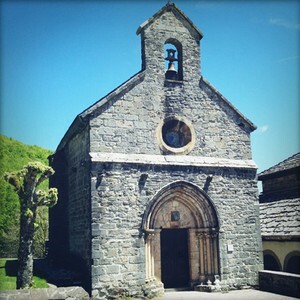 We received our pilgrim’s passport and stamp in St. Jean Pied de Port and stayed our first night in an albergue (a hostel exclusively for pilgrims). 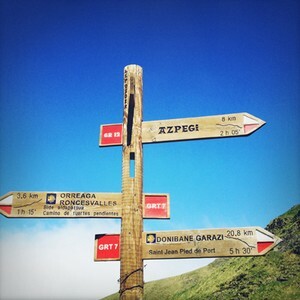 We climbed up and over the Pyrénées in the first two days. It was very steep and our feet were sore, but the landscape was magical. We traveled through forests, farmland, and tiny medieval villages and made our way to Pamplona in a few days' time. Once we arrived, we had café con leche and anchovy sandwiches at on the Plaza del Castillo (famous for being Hemingway’s hangout during the San Fermín festival for the running of the bulls). In the morning I hopped on a train bound for Madrid to spend my final day at the before flying home to New York. This was especially great: On the Camino we became friends with interesting people of all ages and backgrounds from around the world: Brazil, Croatia, France, Ireland, Holland, Germany, Kansas, Finland, Japan, Korea, Slovakia, Australia. We would have a great conversation with someone over dinner but never expect to see them again (our pace was slower than most). Then they would pop up a few days later on the trail and it would be like seeing a long-lost friend! But this wasn’t: Aside from being only about ten euros a night, albergues are an important part of the experience and a great way to meet people. However, you are sleeping on a creaky bunk bed in a room full of strangers. The snoring can be so loud that you will not be able to sleep. After three days of 15-mile hikes, we decided to splurge for a private room at a pensione. It was completely worth it. 1. Glad you packed: Only two changes of clothing. You really don’t need more, and it’s incredibly liberating to not have to think about what to wear. Washing your clothes in a sink and hanging them to dry in the sun is part of the no-frills experience. 2. Didn’t need: More than one book. Pilgrims leave books and extra belongings they don’t want to carry anymore at the albergues, so you can always pick one up. Every ounce in your backpack counts. 3. Brought back: Local honey and cheese, Spanish toothpaste, traditional soap, an interesting ball of rough twine used to clean floors and tubs, prints from Velázquez, Zubarán, and Caravaggio from the Museo Prado. 1. Neighborhood to explore: The Barri Gótic neighborhood in Barcelona. It’s the oldest area in Barcelona and dates back to medieval times. Incredible architecture. A great place to get lost. 2. Site/place/thing you did: Beautiful old cathedrals are common in Europe, but as an American doing the Camino for the first time (and not a particularly religious one at that), they took on a particular significance, as the journey is inevitably a spiritual one. They offered great historial and cultural lessons. We visited an ancient Gothic cathedral almost every day. 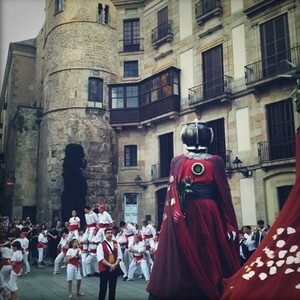 One of our favorites was the in Pamplona. 3. Cafe/casual hangout: It's hard to top eating apples and sandwiches on a grassy knoll high in the Pyrénées surrounded by fresh air, wild horses, and sheep. What’s the local speciality? We were in Basque country, so we ate seafood like bacalao (salt cod) and octopus, white bean stews, delicious sheep cheese, local white asparagus, and pimiento de piquillo (small, red, cone-shaped peppers). Delicious! There were limited lunch options on the Camino — and fresh vegetables were hard to come by — so lunch was usually a bocadillo with jamón y queso (baguette with local ham and cheese) or a potato tortilla if we were lucky. I had the best paella of my life at in Barcelona. Were you there for the right amount of time? No, definitely not long enough. Spain is a country you can spend a very long time exploring. 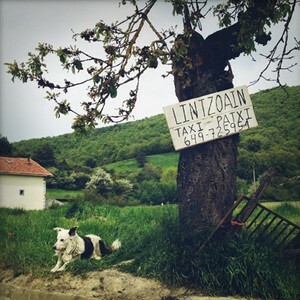 The Camino is one of the best ways to experience rural areas and interact with locals. Any places you didn't get to visit, but wanted to? 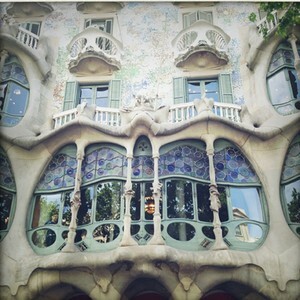 Gaudi’s and the in Barcelona. What’s tips would you give a friend who wanted to go? Learn some Spanish (we knew very little, but my high school French came in handy), pack lightly, and break in a very good pair of hiking shoes. Any surprises? The immediate kinship with fellow pilgrims; the kindness and generosity of the local people who go out of their way to help peregrinos. What was your Kodak moment? Watching the sunrise over the Pyrénées and seeing the blessing of the pilgrims at the cathedral in Roncesvalles. Would you go back? In a heartbeat! This trip was the perfect balance of city and country life. Barcelona is one of my favorites now. I only got a taste of the Camino in five days. Returning to complete it in the next year is on my must-do list. When you're at kilometer 30 and need an aspirin, you'll be glad you stocked goodies from Popupla's first aid shop. Catherine is based in New York City where she is a publicist for the visual arts and fashion. She travels to see how other people live.